With Tegra 4 to the top? All good things are worth waiting for: Nvidia's Tegra 4 SoC celebrates its long awaited debut. Toshiba's new 10-inch tablet Excite Pro combines the high-end chip with a high-resolution WOXGA display, tremendously fast 802.11 ac radio and speakers by Harman/Kardon. Our test reveals what other highlights the newcomer has in store. As we initially touched upon, the keyboard and case combination of the Excite Pro makes for a viable laptop replacement - albeit a businessy looking one - but one less elegant than the likes of the Asus Transformer Pad TF701T. Toshiba has made a good, solid product in the Excite Pro, but it's not one that makes us want to jump around abound with excitement because, while decent, where's the unique selling point? What is likely to shift it is the association of a super-high resolution screen - the same resolution as the Samsung Galaxy Note 10.1 2014 - at a price that is just about on par with its competitors. Although the Toshiba Excite Pro is a speedy Tegra 4 tablet with a high-res display and great audio, it lags behind similarly priced competitors when it comes to design and battery life. For just $20 more, you can get the ultraslim and water-resistant Sony Xperia Z, which has much longer endurance and more features, such as the ability to control your TV. 80% "Scharf und flott mit Tegra 4 "
Positive: Quality display with excellent viewing angles and high resolution; great autonomy. Negative: Relatively heavy and expensive. Positive: Powerful NVIDIA Tegra 4 chip; vivid colors of the IPS screen; high functionality; Harman / Kardon sound. Negative: Low quality of the rear camera. 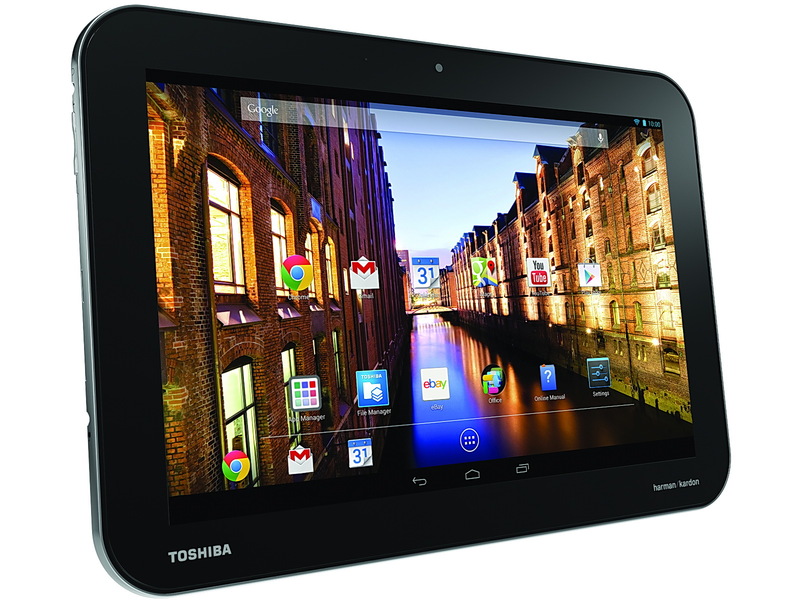 Toshiba's new 10-inch Android tablet, the Excite Pro, is geared towards high-end users who want maximum performance. Performance is the main selling point of this product – with its top of the line 1.8 GHz Tegra 4 chip. The IPS display features a unique and very fine resolution of 2560 x 1600 pixels. Currently, the tablet is the best one in performance and display. Toshiba even installed what they call a companion core to decrease power consumption during less intensive tasks. Unfortunately, the high-performance components empty the battery faster than most other devices. Another extremely desirable feature is the MicroSD slot, which allows expanding the storage capacity by up to 64 GB. In addition, the Excite Pro is also one of the first tablets supporting the high-speed standard 802.11 for higher speeds and improved connection stability. The device is undeniably premium in price and specs, but look and feel could be better. With a height of 10,5 mm and a weight of 630 g, it is cumbersome and thick. The silver colored plastic casing on the back creaks and deforms from pressure, which is quite disappointing. The surface has a fine point structure to improve haptics and grip. If high performance is needed, there are no better options available at the moment.